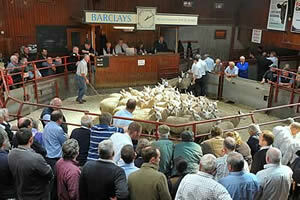 The Cumberland & Dumfriesshire Farmers Mart had forward 3,283 Store Lambs and Feeders at their Weekly Sale at Longtown on Tuesday 20th December, 2011. A good show of stores easily maintained last weeks high rates. Top of £90 for Texels from Ridley Farm, others £85 Castletown, £84 Tyrone House; Beltex £88.50 Netherplace, £83.50 Pallet Hill; Zwartbles £82.50 Cottage Farm; Lleyn £79 Windyknowe; Suffolk £78 Newbiggin, £76.50 Auchans; Charollais £75.50 Newbiggin; Cheviot Mule £75.50 Whitslade; Blackface £71.50 Alnham Castlehill, £69.50 Auchans; Greyface £71.50 Upperburnmouth; Romney Marsh £70.50 Rammerscales; Easycare £68.50 Bairnkine; Swaledale £63.50 Broadmea. The 407 Cheviots met a great trade to a top of £74 Alnham Castlehill, £73 Thomas Telford, £68 Falnash. Cast ewes to £76.50, cast rams £83 Bayles.